Golfers tend to be very protective of their swing. Tell them where you think they are going wrong over a sociable drink in the clubhouse and they can become very sensitive. Even to the point where they turn the conversation on its head and start telling you where you're going wrong. Ouch! Of course it may be that the gentleman or lady in question may themselves be aware of the problem, either through poor shot making or because their body is telling them things aren't as smooth as they could be. It's just that they didn't want it pointed out in front of their companions. But really there's no need for such a reaction because, let's face it, none of us possesses the perfect swing, mainly because it's impossible to quantify because no two players hit the ball in exactly the same way. Even for those of us who believe we're progressing nicely in terms of scoring and feeling physically good, the odd tweak here or there could result in tangible benefits. Practice is the key. The American golfing legend Ben Hogan was famous for it because he believed you never stop striving to get better. As a result, his performances did get better. He even took time during his playing career to make alterations to his swing, proving that you're never too good to find ways to improve. Evidence to back up his philosophy? Well, how about a career total of nine majors - four US Opens, two Masters, two PGA Championships and one British Open title? Sounds like pretty strong evidence to me. You might not have the time to take in 18 holes more than once a week, but simply an hour here or there at a driving range can work wonders in improving both posture and timing. The results will become apparent when you next take to the course. Overconfidence is one of the dangers facing swing action, so don't fall into the trap of believing that increasing the speed of your swing means that you are becoming a better player. Snapping back on the backswing and quickly forward towards the ball may actually cause you to hit the ball incorrectly. So don't rush things. Keep thinking about each element of the swing as you execute it. One method is to pause at the top of the backswing, giving yourself time to mentally and physically gear yourself up to attacking the ball in a more measured way. 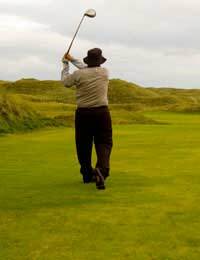 It is also beneficial to periodically seek the advice of the club pro. You may feel good about your swing, but the observations of a third party can be very valuable in spotting weak points. As with other aspects of the game, bad habits can creep up on you and signing up for a lesson on a regular basis can prevent this happening. More to the point, constructive criticism coming from the pro rather than a well meaning fellow member in the bar is more likely to be well received.